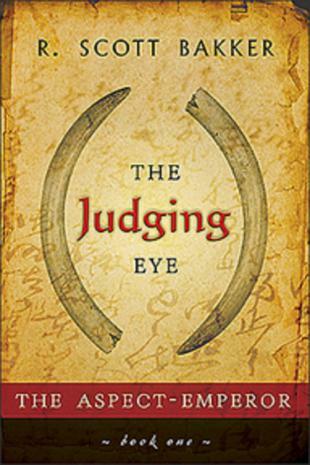 The Judging Eye by R. Scott Bakker was one of my most anticipated read of 2009 (well for the first part of the year at least). Having greatly enjoyed the first trilogy from Bakker (Prince of Nothing ... like you don’t know... and if not, I urge you to consider it), hopes were reaching the sky for the next one (The Aspect Emperor). Well I loved it! It's a very good read, satisfying and profound. Still, I was somewhat just a little bit disappointed and I'll explain why. Don’t misunderstand me, I liked The Judging Eye a lot but I expected more, mostly with the story. Maybe I'm not patient enough. The epilogue of the first trilogy was giving us a very interesting glimpse of the evil "that comes before" and I would have liked to see more of the Consult and Inchoroi. Fortunately, I think that what I'm hoping for will come with the follow up. 20 years have passed, The Great Ordeal lead by the warrior-prophet Kellhus conquered the whole Three-Seas and is now marching toward Golgoterath. Within this ordeal, a young conquered prince is struggling. The wizard Achamian, in exile, is having new revelations in his dreams and setting on a quest for truth with the daughter of his lost love. The path is treacherous even with a Nonman and his acolytes. In Momemn, the empress is having great troubles with her sons and daughters. Even with the help of Maithanet, she struggles at the head of the empire while a cult is getting ready for the White Luck Warrior. First, I think Kellhus has simply become much too powerful. That situation and its effects create an unbalanced felling of power between the protagonists (I king of agree with Orson Scott Card about this kind of problem....). We’ve got Jesus with incredible magic. I know that within the story he is almost a God, but then, for example, why use an army to conquer a city when you can pull it down by yourself... At least he's mightily cool and daunting :). He also creates an impression of intelligence for both himself and the author, you feel there's a lot of thinking behind his persona. But even if the story is mostly given through the eyes of characters we already know, some new point of views are fascinating. For instance, Kellhus' deliciously bad “mother love longing” son Kelmomas and the king of Sarkapus' son Sorweel thread are the best additions. I can’t say I feel the same for Esmenet or Mimara though. This last one narrative is too different form the rest, it breaks the fluidity of the prose but you get use to it. And Achamian! God I ache for Achamian! Here we have an awesome character. Give me more Scott! His struggle (and the dreams of Seswatha he is witnessing) is the kind of stuff that will be keeping you from putting the book down. The tale recounted in this first step for the follow-up to the series is not as engaging as the first trilogy but it's building up to be. At least, the crusades are over, they were exciting to live through but moving to something else is refreshing. By the way, you really have to read the Prince of Nothing books before in my opinion, it's not the kind of trilogy that stands alone well. Then you'll grasp more of this rich world. Even if this world (mostly so for the south part of it) is just a little bit too much like the old Middle-east from our real world... But anyway, my anticipation for The White Luck Warrior is very high. I think that the only thing I disliked from The Judging Eye was that sometimes the chapters were too long. Give us more pace, faster switch from POV! Other than that, awesome writing, just a little less “philosophically-religious" that the first trilogy and even though that's actually one of the great strengths of Bakker, too much of it could have rendered the book unreadable. Finding the right dose must have been hard for the author but he did it. Technically, the cover for the Penguin Canada print is just ok, nothing that stands out in both ways but the map (I'm among those who loves them, look for it here) and appendices are simply perfect. Was also a bit let down by the beginning of the new trilogy, but as you pointed out, Achamian's PoV makes up for the rest of it. I felt that this book was more of a setup to the next two than anything else. Bit late, but welcome to the SF/F book blogger world! I like the template. Bravo Bakker, keep it up. You're verbose and sometimes over-complex, but I'll take poor, old, beaten down Akka, over some of those other sword-wielding super-men(and women) any day. I just finished reading 'The Judging Eye' last night. As usual, I was absolutely blown away. Bakker's writing never fails to invigorate me. From the deep philosophical insights, much of which admittedly flies right over my simpleminded headed (lol), to the deep relationships, the book is literally teeming with such intricate detail that I often had difficulty putting it down.